Use the correct sized pan for the ring or burner on which you are cooking and put close fitting lids on pans, this will retain the heat and reduce wasted energy. Cook food in bulk to use all the space and heat in your cooker. 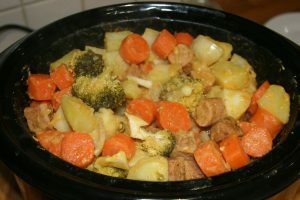 Once the food has cooled, freeze it in separate portions for reheating at a later date. Cut food into smaller pieces: that way it will cook more quickly and save energy. Turn down the ring or burner once the required cooking temperature or state is reached. Simmer food rather than boiling it into a mush! Use the fan assisted cooking option if possible. This helps to evenly spread heat around the oven, resulting in reduced cooking temperatures and times. We recommend ovens and hobs that have an ‘A’ energy rating as they are the most efficient. New A+ rated electric ovens will consume 40% less energy than a B rated oven. 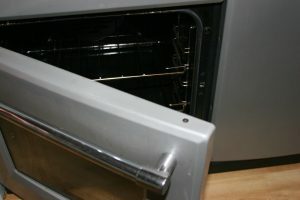 Keep your oven door closed while you’re cooking (opening it loses up to 20% of the heat). Keep the oven door clean so you can look in to check your food. In a conventional electric oven, the amount of energy transferred from generating heat into cooking is only approximately 10%. Try and use all the tricks mentioned here to help maintain the efficiency of your cooker. 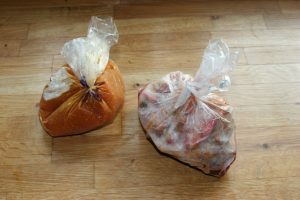 Cooking food straight out of the freezer can double time needed in the oven compared to de-frosting food first. Potatoes take far longer to roast in the oven if they are not par-boiled first. 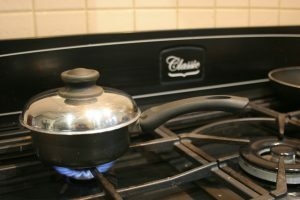 Even assuming you use the right sized pan, only 40% of the energy from a gas hob is used for cooking (the rest is wasted heat). Teflon coated pans remove the need to use fat to prevent food from sticking. 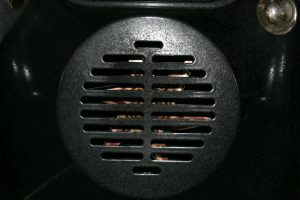 However, they have a dark side – toxic fumes from Teflon when cooking at high temperatures can kill pet birds and may cause flu-like symptoms in humans. Teflon comes from Perfluorinated Chemicals (PFCs), these are nasty compounds which have been linked to smaller birth weight and size in newborn babies, elevated cholesterol, abnormal thyroid hormone levels, liver inflammation and weakened immune systems. They also wreak havoc on the environment.